As the base of the banner has a relatively wide footprint, there is no need for protruding feet in order to keep it stable when used indoors. The base has a silver aluminium finish. Our Euro pull up banner stands is available in two sizes to suit your business’ needs at a variety of locations, exhibitions and tradeshows. The wider of the two (at 1000mm) is also available double-sided. At Displays Direct, we use high resolution JetPrint graphics, which are a PVC-based substrate that offers durability and high definition with bright colours. Is the Euro pull up banner stable? Yes, it is. 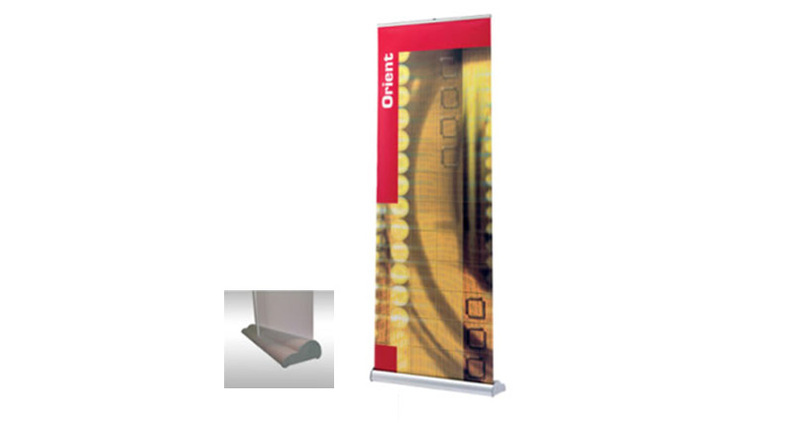 The banner is designed for indoor use and has a wide footprint to ensure stability. How long is the turnaround time on these banner stands? Our normal turnaround is about 5 working days from receipt of finished artwork to despatch. However, if you need a quicker turnaround time we always endeavour to meet your deadline. Can I reuse the banner stand with a new graphic? Yes, we can re-skin our banner stands. Simply give us a call or send us an email and we’ll be more than happy to provide a quote.